The schedule will be released ~1 week prior to the event. Raffle drawings will occur between events. Each participant will receive a complimentary raffle ticket and additional tickets can be purchased at the raffle booth. The fourth-annual Ben’s Memorial Mile will be an inclusive, evening-long event: an occasion filled with running and walking races, mental-health promotion, raffles, concessions, and other fun activities! Please show up with your family and friends ready to participate, cheer on the other runners, and learn about mental illness, all while supporting a great cause. June 15 – Packet pickup onsite starting at 4:00 pm. There will also be race-day registration ($30 for adults + older kids; $5 for the Little Kids’ 100-Meter Dash). 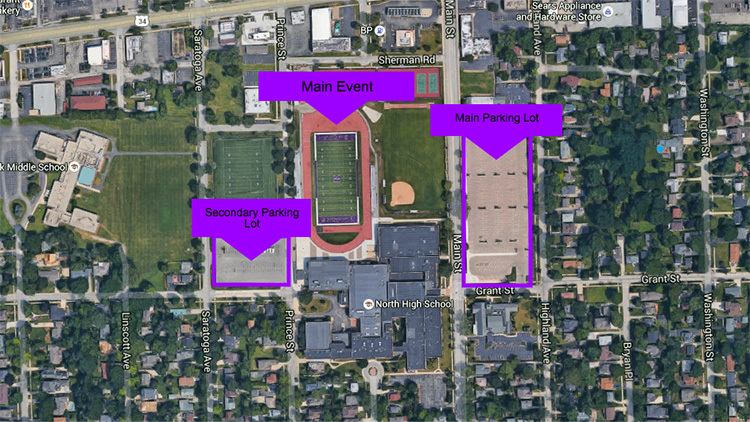 In the event of inclement weather, we will move the events to DGN fieldhouse. Gift certificates will be supplied by Peak Running for the top three males and females! Downers Grove North is located just south of Ogden Ave. on Main Street. The main parking lot is on the north east corner of Main St. and Grant St.